So we met mid-morning. I was ready for lunch; she for breakfast. The egg panini Claire chose cost $5.25. Tucked into a crunchy-soft bun was a pretty nice omelette, well seasoned, buttery, it came layered with Gruyère cheese, leaf lettuce and sliced Roma tomatoes. Heated up on the press (for not quite long enough we decided, and with the lettuce still unfortunately inside) it was, notwithstanding those errors, a pretty tasty package. 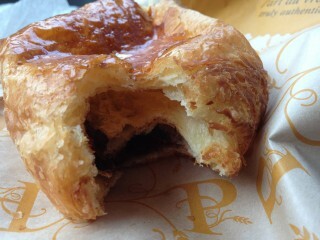 I had a pain au chocolat ($2.25), which is a good test of two things: the quality of the dough (is it soft and flaky, without being flabby inside? Does it correctly shatter in the mouth? Does it taste of classy butter?) and the superiority of the chocolate (smooth, clean, silky feeling). It passed the careful examinations of two picky women. Not sure it was the best pain au chocolat in the city (still researching that) but it was certainly a mid-morning pleasure. Everything was ‘to go’ Our chocolatine got a bit squashed in the bag, weighed down with the panini, and the photo doesn’t do the thing justice. Particularly as we then had to take a bite, each of us, to show you the quantity of chocolate. Which we found pretty generous and very fine. 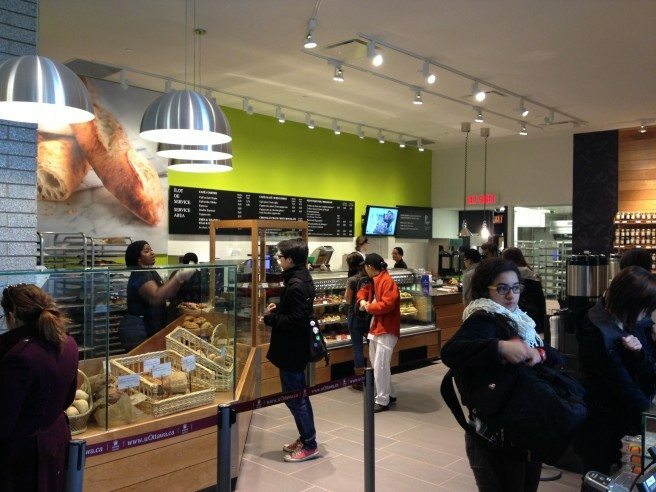 So welcome, Première Moisson, and full marks to U of O for thinking outside the fast food chain box. Makes me think going back to school wouldn’t be such a bad thing. It all passed the Claire test anyway. And she’s a natural critic. Social Sciences Building, 120 University Dr., University of Ottawa. Hours: Monday to Thursday, 7:30am to 7:30pm; Friday, 7:30am to 5pm; Saturday and Sunday, 8am to 3pm.